Alachua County is in the process of updating its Comprehensive Plan. Over the coming year, Alachua County will be engaged in a process of evaluation and appraisal of its Comprehensive Plan culminating in an update of the Plan. The work plan approved by the Alachua County Commission outlines the major components and general timeline for this process. 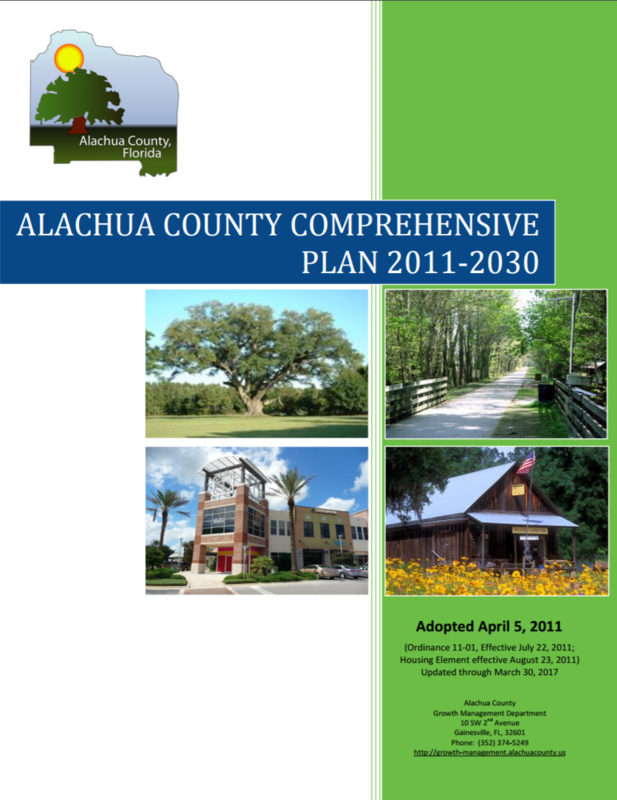 The Alachua County Comprehensive Plan: 2011–2030 is a longrange plan for guiding local decision-making and implementing our community’s vision. It consists of fifteen Elements addressing aspects of our community ranging from land use and transportation to natural resource protection in a policy framework adopted by the Alachua County Commission. Public participation is a key component of this process and a requirement of the Alachua County Comprehensive Plan. Your thoughts, ideas, and participation are needed to make this Plan Update a success. Please consider subscribing to our email list for news about the Update process as it unfolds, including upcoming opportunities for you to participate in shaping the future of our community. As required by Florida Statutes, at least every seven years local governments in Florida must determine whether there is a need to amend their Comprehensive Plan to reflect changes in the State's Community Planning Act Ch. 163, Part II, F.S. since the previous update; Alachua County must notify the State of Florida of this determination by April 1, 2018, and then prepare and submit needed Plan amendments within one year. The County will also be evaluating and updating its Comprehensive Plan to reflect changes in local conditions. Local issues for the Evaluation & Appraisal and update of the Comprehensive Plan have been identified based on input from the public, citizen advisory committees, community groups, County Commission, and county staff. Work Plan Presentations to citizen advisory committees, where they had the opportunity to discuss the issues and submit their input, are documented in the sidebar list. The Local Planning Agency received an update presentation on February 21st summarizing local issues that have been identified and a draft copy of the Notification Letter to the state of Florida. On March 13th, the County Commission approved the Notification Letter for signature by the Commission Chair. What areas are most important to you?